It's not every day a prince is born. Congratulations, William and Kate! Following the birth of the new prince via the Internet, television, newspaper and about every social media outlet possible made me nostalgic for my time in England just a few short years ago. You guys, England (in my personal, very biased opinion), is a phenomenal place. It's charming, quaint, bustling, traditional and oh so perfect. Ever since I can remember, I have imagined England to be a magical place. Six years (and a fantastic English vacation later), I am still convinced it is one of the most fantastic places on the planet. Not to mention, I'm a huge fan of chilly temperatures and a rainy day. Yesterday made me unbelievably nostalgic (so much so that I had to tear myself away from ticket-searching on Expedia.com). So what did I do instead? I shopped. My wallet is currently happy with me (I haven't bought anything yet), but the day is still young, folks. I adore all things British. I mean, how cute are these things? You're telling me. Harrods Bag - Any shopping addict can tell you, Harrods is amazing. I think I purposely tried to get lost with the hopes of never ever leaving. One of my favorite parts were their charming green shoulder bags. Perfect for anything and everything. Trench Coat - In my opinion, the trench coat is a classic staple that should make it's way into every closet. I'm still saving up for mine (I told myself a long time ago that a Burberry trench coat would make its way into my closet and never leave). The Beatles - A lover of all things England with a little hippie streak, The Beatles are my anthem and my lullaby. I heard my first Beatles song as a toddler through the speakers of my great aunt's jukebox. Ever since, it's been a love affair. Oven Mitt - I THINK I NEED THIS. Somehow, this has to make its way into my kitchen. Jamie Oliver's Great Britain - My tastebuds have been craving a bit of English food lately (I think my body is already prepping me for winter), and I've been eyeing up Jamie Oliver's Great Britain. I think that might be the next cookbook we welcome into our kitchen! Fur Scarves - I'm not sure if it's the cool temperatures, rainy days or English countryside that does it to me, but when I think of dressing for a stint in England, my suitcase wouldn't be completely packed without a faux fur scarf. Clotted Cream - Eating an entire jar might send you into cardiac arrest, but if that happened, I know I'd die happy. Heaven in a jar, my friends. Burberry Brit - I bought my first bottle in Middle School (insert question about how I found enough money to buy myself that perfume, or how ridiculous I must have appeared to my parents). Years later, it's still a favorite. Clear Umbrella - Have you ever been walking on a crowded sidewalk during a downpour? This thing is a godsend. Rug - OK, I threw this one in here for fun. If I could afford to buy that rug, it would be in our apartment quicker than you can say "God save the Queen." Cadbury Dairy Milk Caramels - FORGET what you have seen here, my friends. Trust me - one bite of one of these chocolate bars and there is no turning back. Rain Boots - A must for any rainy-day traveler. In black? 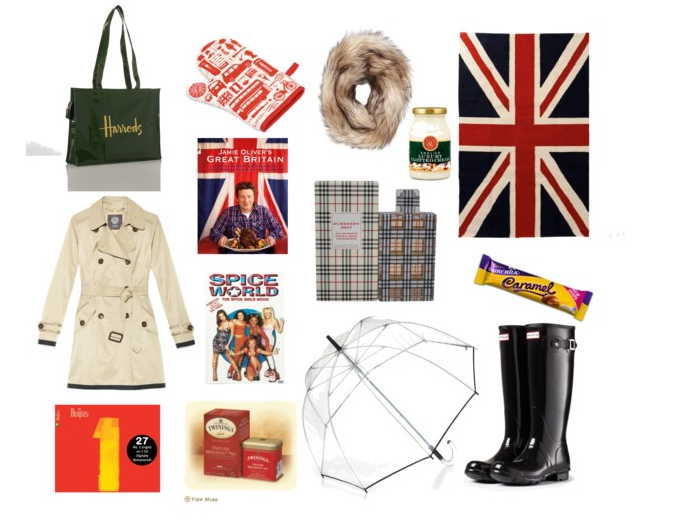 A classic (and oh-so British). I apologize in advance to your wallets, gems.